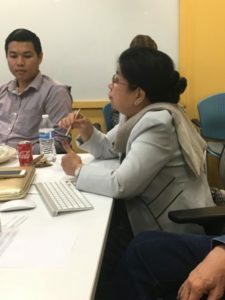 On October 12, Partnership for Transparency hosted its partner Pansy Tun Thein, Executive Director of the Local Resource Centre, an umbrella organization of over a 1,000 CSOs in Myanmar. Pansy shared how civic space has improved in Myanmar and the extensive advocacy and service CSOs have undertaken to continue to open civic space and represent citizens’ concerns. In the aftermath of Cyclone Nargis in 2008, community based organizations gained the community’s trust though their effective and thorough response in regions and among populations that traditional aid did not reach. CSOs were better placed to respond to the needs of women, children, and displaced people than were government actors or international organizations that had not had a presence in Myanmar before the cyclone. This response also demonstrated to international donors and the government that, despite years of repression, civil society actors were ready to take their place as equal partners in development. In order to meet the needs of the community and the increased expectations placed on them by the government and international organizations, civil society actors sought to improve coordination and began to form networks. In this environment the Local Resource Center was established as a coordinating body for the local CSOs and to provide capacity development, training, and research for evidence-based advocacy. The lessons learned from the cyclone brought the local and international community, including civil society, together in creating joint humanitarian and development plans. Two clusters established in the after-math of Cyclone Nargis continue to this day as the Food Security Working Group and the Gender Equality network. With improved coordination and operating space, civil society in Myanmar has been aggressively advocating legal reform including laws on prevention of violence against women, freedom of assume and expression, right to information, and peace building and national reconciliation. Civil society actors continue to fight for a seat at the table and have partnered with various international organizations and actors to analyze drafted laws and provide input. They have led initiatives for increased transparency advocating for Myanmar to join the Open Government Partnership and the Extractive Industry Transparency Initiative which the government signed in 2014. Donors, such as EU, USAID, DFID, AusAid and development partners like the World Bank and ADB have been supporting many programs to strengthen civil society capacity, including the EU-funded Promoting Equitable, Accountable Civic Engagement (PEACE) program implemented by PTF, LRC and Helvetas Myanmar. The PEACE program aims to contribute to local civil society organizations’ participation and influence in the planning, implementation and review of development projects, services delivery and policies at national and sub-national levels for more inclusive and equitable development in Myanmar. The project will provide 210 small grants to eligible CSOs to empower them to function as systematic organization in an accountable and transparent manner. Pansy Tun Thein added a note of caution on how donors and development partners must continue to consult civil society and focus on citizen-needs rather than advancing externally imposed agendas. Funding concentrated in too few areas has increased competition among CSOs rather than promoting the necessary collaboration and cooperation needed to address emerging challenges.